I received my first printed circuit board for the ultrasonic anemometer. After soldering all the parts together I began some testing to see how the design worked. There were some very successful parts, and some things that will need to be adjusted. The amplifier stage seems to work pretty well. However, because I forgot to order one of the capacitor values in the band-pass stage, the center frequency wasn’t right on. That, however, was not a problem with the design, but rather the designer. Oops! The main issue with the design was not something I expected to be a problem, but in hindsight is something I should have considered more carefully. The problem lies in the 3.3V supply rail. 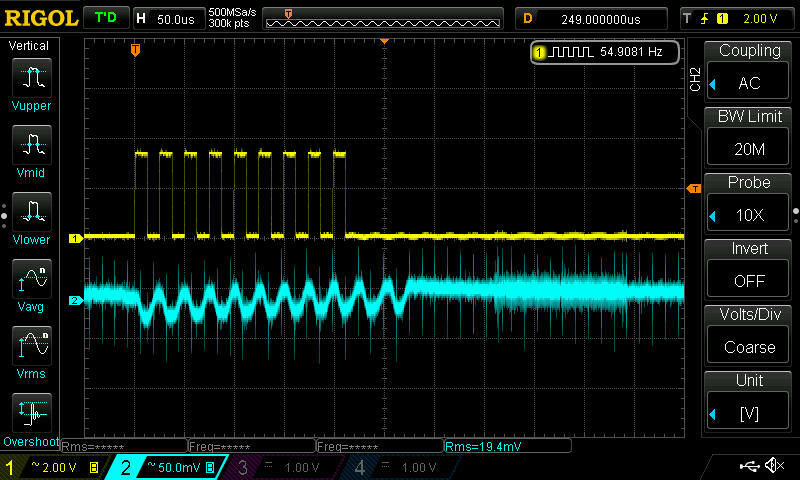 When the micro-controller drives one of the transducers there is quite a bit of noise on the 3.3V supply rail. Because everything (including the amplifier circuits) are connected to that supply the noise appears on the received signal as well. I think the best solution here is to isolate the sensitive analog stages from the digital supply. This will take a separate power supply. This is a downside because it will add components and cost, but I think the expense is warranted and will result in better performance. I also added a capacitor in the mid-supply generation circuit to help keep the bias point closer to the midway point between the two rails for the analog circuitry. I also decided to increase the gain of both stages of the amplifier. I must have underestimated the gain requirement of the system because the output is too low at present. While I wait for the modified circuit boards to arrive I’ll spend some time using what I have now to begin working on coding the firmware. Although the current design has some problems, there is nothing that would prevent me from getting 90% of the code finished before the new boards arrive. I’ll start to cover the C code in the next part of this series. very nice work, love your choice of the easy and fast replaceable connectors. Are you going to use the Raspberry Pi as ucontroller, like in your other posting? Maybe using an amplifier (some 4 in one IC type) would be safer than direct driving the transducers, considering that this is all exposed to the elements. Are you going to use a folded path for the sound? That makes the unit much smaller and less exposed. Looking forward, thanks! I’m currently re-designing the audio path to deal with some crosstalk issues. I think that will involve a simple transistor driver to give some isolation between the transducers and the uController. There is an atmega328u on the board at the moment, and the system is designed to be placed on a RS-485 bus, so almost anything could be used to talk to it. Indeed, a Raspberry Pi lives on the RS-485 bus that I’ll be using it with, so eventually the Pi will be able to ping this device and get the wind speed whenever it wants. I have some idea, but I’m not sure I know exactly what you mean by “folded path”. Can you elaborate? Nice project with very simple approach compared to what others have shared on internet. 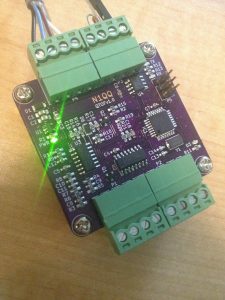 I was wondering if you could email me with the code for switching this MUX and doing all the transitions between the transceivers, I am currently trying to implement similar project but I am gathering ideas of how to generate pulses with interrupts and switch sensors by Axis and Direction.